We put the samples in the oven and ran them on cycle P1. We then covered our samples in Parafilm, inverted them gently to mix in the Rhodamine, and allowed them to incubate at room temperature in Rhodamine for 2 hours. After 2 hours, we spun down the samples, pipetted 3.5mL of the supernatants into polystyrene cuvettes, and measured the UV-Vis absorption of each. 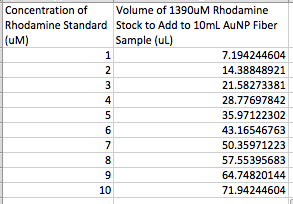 Since we only used 9 samples for our 2 hour incubation, we used 10 of the remaining lysozyme samples that we synthesized yesterday in order to make a standard curve for the UV-Vis absorption of Rhodamine as a function of its concentration in the supernatant of our fiber samples. We then covered the samples in Parafilm, inverted them, and spun them down for 2 minutes. We pipetted 3.5mL of each supernatant into polystyrene cuvettes and measured the UV-Vis absorbance. All of the BSA fibers we tried to synthesize yesterday failed. However, the lysozyme worked. We will use this higher ratio of gold:lysozyme in our samples moving forward. 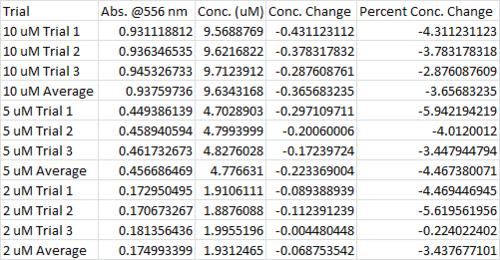 Figure 2: The table above shows the raw and calculated data including the peak absorbance, the concentration that this absorbance corresponds to, the change in concentration after incubation, and the percent change in concentration. Figure 3: The chart above displays the percent change in concentration of Rhodamine B in solution after incubation for 2 hours. Blue bars correspond to 10 μM initial Rhodamine concentrations, red bars correspond to 5 μM initial Rhodamine concentrations, and green bars correspond to 2 μM initial Rhodamine concentrations. 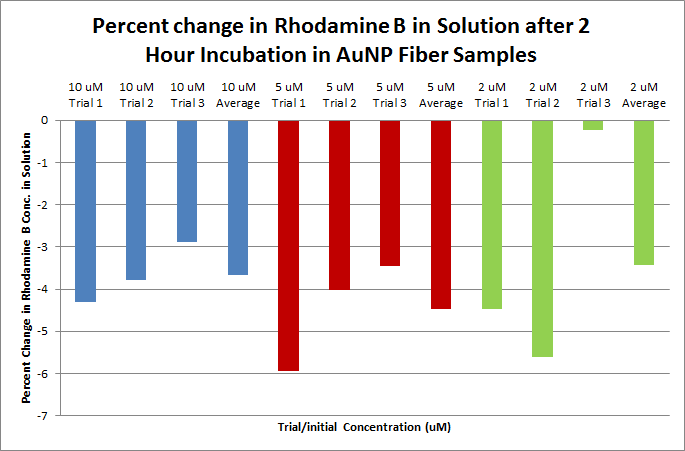 As expected, the concentration of Rhodamine B in solution decreases indicating that Rhodamine B is likely being incorporated into the AuNP fibers. Figure 1: The graph above is a UV-Vis calibration curve relating absorbance of Rhodamine B at 556 nm when dissolved in AuNP fiber supernatant to the concentration of Rhodamine B. The equation of the line is included on the graph. The high R2 value indicates the strong fit of the trendline/equation to the data.